A warplane has attacked Tripoli's only functioning airport as eastern forces advancing on the Libyan capital disregarded international appeals for a truce in the latest of a cycle of warfare since Moammar Gadhafi's fall in 2011. A warplane attacked Tripoli's only functioning airport on Monday as eastern forces advancing on the Libyan capital disregarded international appeals for a truce in the latest of a cycle of warfare since Moammar Gadhafi's fall in 2011. The eastern Libyan National Army (LNA) forces of Khalifa Haftar — a former general in Gadhafi's army — said 22 of its soldiers had died in recent days as they closed in on the internationally recognized government in Tripoli. 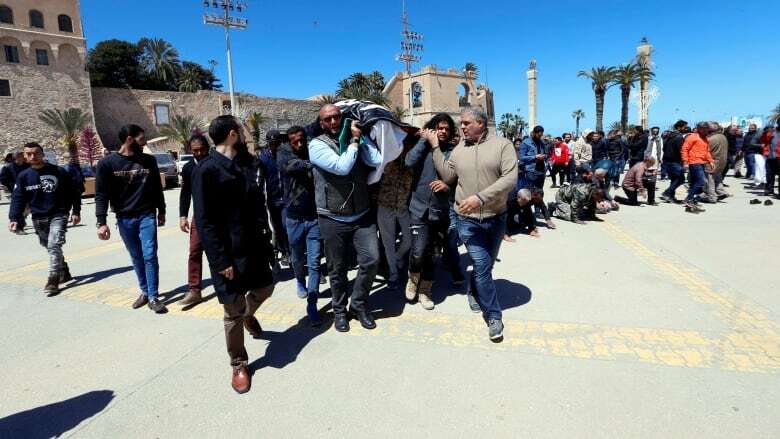 A spokesperson for the Tripoli-based Health Ministry said Monday that fighting in the south of the capital had killed at least 51 people, including fighters and civilians, and wounded 80. The UN envoy to Libya, Ghassan Salame, condemned the airstrike as "a serious violation of humanitarian law." 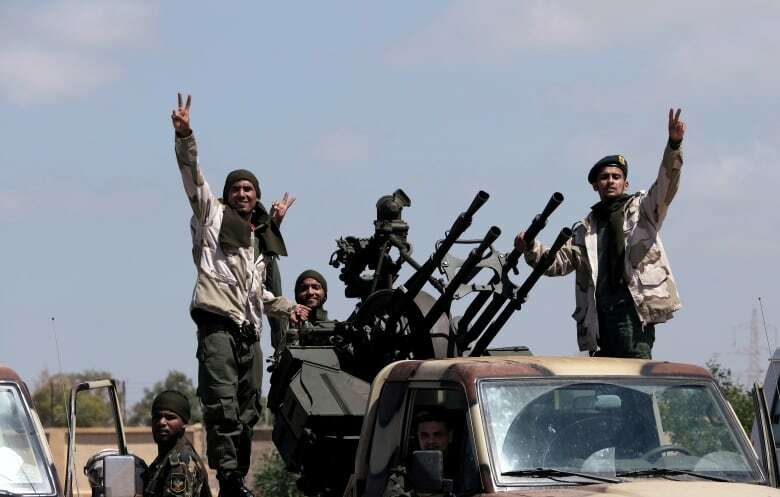 Haftar's LNA, which backs the eastern administration in Benghazi, took the oil-rich south of Libya earlier this year before advancing fast through largely unpopulated desert regions toward the coastal capital. Seizing Tripoli, however, is a much bigger challenge for the LNA. 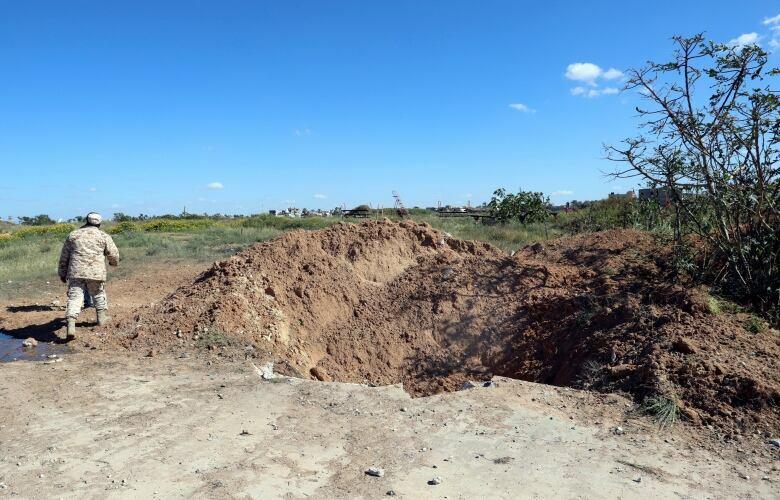 It has conducted airstrikes on the south of the city as it seeks to advance along a road toward the centre from a disused former international airport. "The United Nations continues to call for a temporary humanitarian truce to allow for the provision of emergency services and the voluntary passage of civilians, including those wounded, from areas of conflict," it said in a statement. UN envoy Salame met Serraj in his office in Tripoli on Monday to discuss "this critical and difficult juncture," the world body's Libya mission said. The UN refugee agency expressed anxiety about thousands caught in crossfire and detention centres in conflict zones in a "rapidly deteriorating humanitarian situation." Canada is deeply concerned by military operations in <a href="https://twitter.com/hashtag/Tripoli?src=hash&amp;ref_src=twsrc%5Etfw">#Tripoli</a>. We urge all parties to cease hostilities and support <a href="https://twitter.com/UN?ref_src=twsrc%5Etfw">@UN</a> efforts to advance political reconciliation in <a href="https://twitter.com/hashtag/Libya?src=hash&amp;ref_src=twsrc%5Etfw">#Libya</a>. We stand in solidarity with Libyans and supports their desire for peace and a better future for all. As well as the United Nations, the European Union, the United States, Canada and the G7 bloc have all urged a ceasefire, a halt to Haftar's advance and return to negotiations. "The U.S. is deeply concerned about fighting near Tripoli," State Department spokesperson Morgan Ortagus said early Monday. "We have made clear that we oppose the military offensive by Khalifa Haftar's forces. We continue to press Libyan leaders, together with our international partners, to return to political negotiations." The LNA says it has 85,000 men, but this includes soldiers paid by the central government that it hopes to inherit. Its elite force, Saiqa (Lightning), numbers some 3,500, while Haftar's sons also have well-equipped troops, LNA sources say. Analysts say Haftar has swelled his ranks with Salafist fighters and tribesmen, as well as Chadians and Sudanese from over the southern borders, claims dismissed by the LNA. Islamic State staged some high-profile attacks in Tripoli last year, but the militant group has largely retreated to the desert of southern Libya since the loss of its former stronghold in Sirte late in 2016. France established close relations with Haftar under the previous government of François Hollande and his defence minister, Jean-Yves Le Drian. When current French President Emmanuel Macron named Le Drian his foreign minister, Paris doubled down support to Haftar, in close alignment with Egypt and the United Arab Emirates, which see him as a bulwark against Islamists and have supported him militarily, according to UN reports. France's stance has created tensions with Italy, which has sought a leading role to end the turmoil in its former colony that has played into the hands of militants and smugglers.